In this week’s Summer Camp spotlight we check out the week of July 16th in our Coding Sports Camp in Oak Park. This week grades 1-4 will be doing Robotics and Multi-Sport Madness, while grades 3-7 will be doing JAVA Minecraft Modding and Multi-Sport Madness. Legacy Sports and Code Play Learn are partnering to create a week long, full day camp that will engage your child’s mind and body. This camp is designed for students who are currently in 1st-4th grade. Campers will spend half the day exploring engineering and coding with our VEX IQ robotics. 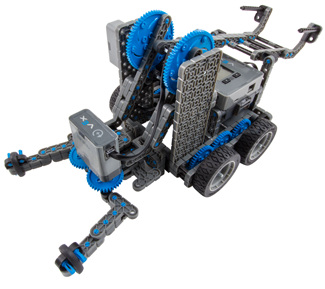 Campers, working in pairs, will construct a variety of VEX IQ robots including the Claw-Bot. After building their bots campers will code them to conquer our challenges using the ModKit programming language. Their programs will allow them to create user driven and AUTONOMOUS programs as they learn the fundamentals of how to control a robot using a variety of sensors that evaluate distance, color, pressure and speed. Legacy Sports and Code Play Learn are partnering to create a week long, full day camp that will engage your child’s body and mind. This camp is designed for students who are currently in 3rd through 7th grade. NO CODING EXPERIENCE NECCESSARY. Campers will be build Minecraft MODS and learn to use the JAVA coding libraries and constructs. Once their MODS are built campers will play using their Minecraft account in their own private server space we provide. Participants will need their own Minecraft account and be familiar with playing Minecraft on a PC.